Language and speech development issues can lead to reading and writing difficulties, impeding a child’s ability to enjoy learning and to experience successful academic outcomes. Poor readers often have an early history of spoken language deficits. Not all communication challenges are rooted in a language and speech disorder, but it is important to make that determination, one way or the other, via a thorough assessment process. If a language and speech challenge is the issue, the summer is a good time to get your child the help he or she needs to be prepared to meet the expectations of the next grade level with confidence and the right tools for success. 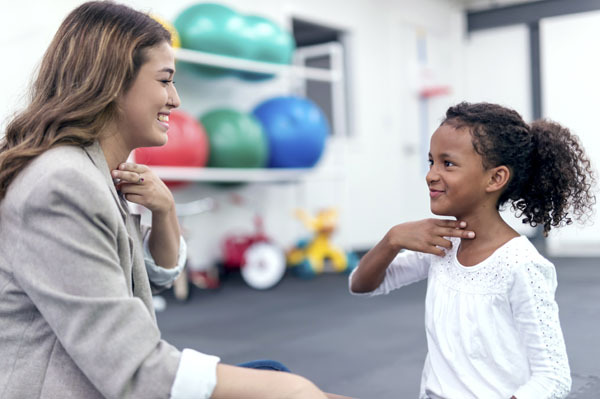 Our Speech Therapists implement the most effective language and speech strategies available utilizing individualized play-based treatment plans. Therapies provide the child the language processing skills needed to be a friend, a learner, and productive group member. More than 70% of teachers believe that students who receive language and speech therapy demonstrate improved pre-reading, reading, or reading comprehension skills. The stress free environment of a summer enrichment speech therapy program provides a child with the support needed, combining learning with play. Without all the expectations of school looming, a child can relax, enjoy and retain skills learned during each session. The development of communication skills begins in infancy. Any communication issue is likely to have a significant effect on the child’s behavior and academic skills. The earlier a child’s speech and language problems are identified and treated, the less likely it is that problems will persist or get worse. This year use the summer break as an opportunity to advance your child’s communication skills. To continue current speech therapy over the summer or to set up a speech and language assessment, please give our office a call. We look forward to hearing from you.